My grandmother on my dad’s side, Idalie Morales de Cuevas, passed away last year. She was a smart, assertive lady, a voracious reader and world traveler. Even at 95 she would spend half a year in Florida and the other half in Virginia, close to family yet fiercely independent. But the beginning of 2014 saw her heart getting weaker, and she was taken to the hospital, where she still battled for several weeks. While I spoke briefly to her before her passing, I often think about the fact that I didn’t get on a plane to be with her during her final moments. I know it’s silly, since there was no way of knowing when – or if – she would actually leave us. She’d pull through before and I thought she’d do it again. But it still makes me feel sad. 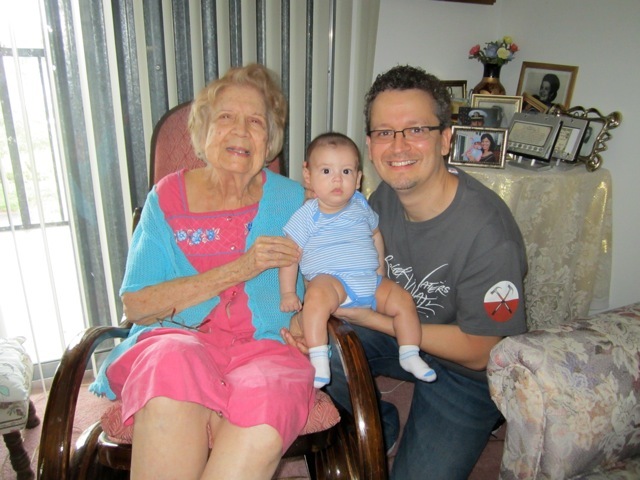 My son and I with abuela Idalie. Several months later, I had a dream. In it, the family was all together at my cousin Minnie’s house in Miami. There was music, food, a general atmosphere of happiness – perhaps it was Christmas, I’m not sure. And suddenly my grandmother was there. Except I knew she couldn’t be, she was already gone. The feeling of happiness dissipated, replaced by the bittersweet sting of her memory. She then asked me, “¿Cómo está todo?” (“How are things?”). I replied everything was fine. Then she repeated the question, and this time I understood what she was really asking was how we were all coping with her passing. I said “Más o menos. Todos estamos tristes” (“More or less. Everyone is sad”). Grandma then got closer and hugged me, and I could smell her cologne, touch the fabric of her jacket, feel her warmth as tears came to my eyes. I woke up crying, and with a particular song pounding in my brain: A pop metal tune from 1991 called We Only Say Goodbye, from Fates Warning’s album Parallels. The lyrics are eerily perfect: “Tonight I felt your presence again / But I heard the distance in your voice / And I knew I was alone,” followed by a chorus of “There’s never time to say / All the things we need to say / When it’s too late / We can only say goodbye.” I’m not certain how much the band was on my mind prior to the dream – I think I may have checked out some of their newer stuff on Spotify. But I know I hadn’t played We Only Say Goodbye in a long while. I don’t believe in an afterlife or in the existence of deities of any kind. Was my grandmother trying to communicate with me, providing the farewell and comfort I had longed for? Doubtful. I prefer to think that our brains can interpret an event and give it context in terms of music, thereby helping us make sense of a senseless world. After the tears had passed I had this melody in my head, somehow softening the sadness, making it alright. The power of a song is truly remarkable. Then again, who knows. 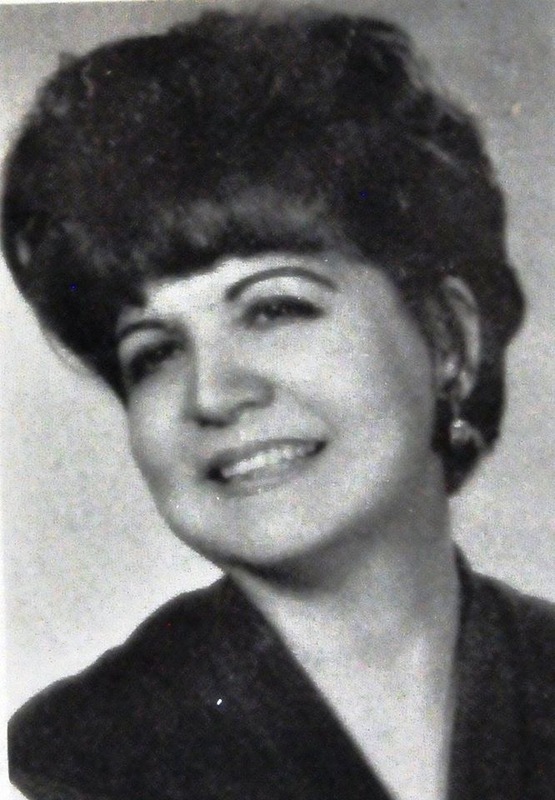 Grandma loved to hear stuff like Guy Lombardo, Plácido Domingo, and Dean Martin. But perhaps she’s somewhere close listening to some metal, with my grandpa covering his ears and exclaiming “¡Idalie! ¿Qué carajo es eso?” (“Idalie! What the hell is that?”). And that makes me smile. You can click on the cover and check out the song. I had a very similar, vivid dream just a few days after my dad passed.